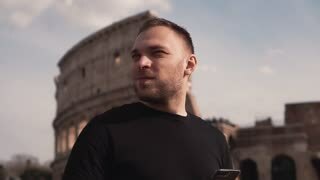 Man in Rome in Italy enjoying trip, sunny weather. 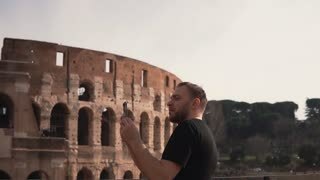 Guy smiles, watches pictures, background of Colosseum. Slow motion. 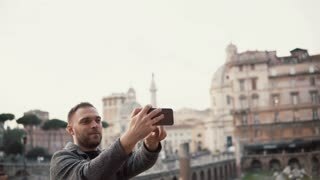 Young woman takes pictures of the arch of Constantine with her smartphone in Rome, Italy in a sunny day. Slow motion. 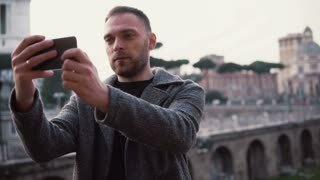 Young beautiful woman takes the selfie on smartphone. 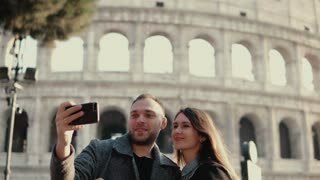 Woman walking in Rome, Italy near the Colosseum.